Say hello to my latest baby! The newest addition to my ever growing family of gadgets. I spent months deliberating which camera to get for myself ever since I lost my good old Canon camera. I have been relying on my s3 for blog photos and although Sammy can produce decent photos, I still want better ones. Of course, I only want the best for you dear readers. 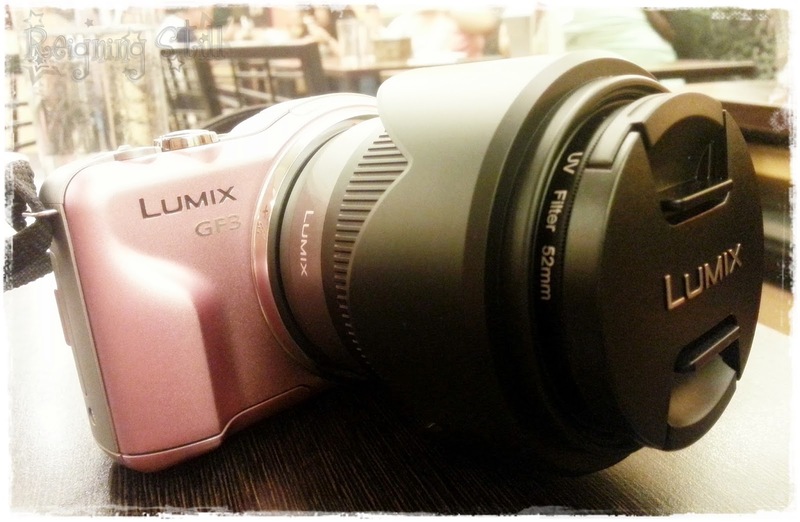 At first, I wanted to get the Lumix LX7 known to produce high quality photos despite it being a digicam. But I can’t find it in any store. I am so tempted to buy from online sellers who definitely sell on much lower value but I’m just not confident enough. Natatakot akong makakuha ng di masyadong magandang quality. Don’t get me wrong. I know there are loads of legit online sellers out there. I have friends who swore by them but natatakot talaga ako eh. And then I found out about the mirrorless cameras. They are basically an SLR camera but is much easier to use and had smaller body. They also got interchangeable lens which is super cool. I was leaning on the Olympus E-PM2 but it’s a whopping Php 33,000++! An extra lens included. I was thinking really hard if its worth it. They said that the image quality is the same as the multi-awarded Olympus OMD. My dream camera. Pero dream lang talaga sya coz its almost 60K! Wag na! And then I come across a stall in SM Mall of Asia selling Panasonic Lumix Camera and found out that Panasonic Lumix GF3 is on sale. It’s only Php18,000++ with an extra battery free. They were trying to make me get the Panasonic Lumix G3 that costs around Php28,000++ and it took all my w3ill power to say no. G3 has a view finder and a built in flash and a tiltable screen. Very mini SLR na talaga ang peg. But the almost 11K difference is too big not to consider. The price. It’s the most affordable mirrorless camera in the market. Lumix LX7 cost around 15K from online sellers. Just a minor difference. The extra battery. It really sold me. I mean, I know how important an extra battery is. Of course it’s not like Sammy who I charge almost 3 times a day but a full day of adventure might drain my battery and I don’t want to miss a single photo-worthy scene just because my batt run out of juices. Plus original camera batteries cost 2K. Bongga na yun. Ease of use. I tried the Olympus and what really bug me is the fact that it’s so hard to change settings. I am not a pro photographer. Actually, ngayon ko lang nalaman ang shutter speed at aperture. But the light meter in GF3 is so helpful I swear! Ikot ikot lang until mag-zero si light meter. Hahahahaha.. Intelligent Auto. I swear! It’s really intelligent. Not plain smart. Intelligent! It produces super nice photos. Perfect for my ninja shot moments. Touch screen. I am so used to my touch screens that I honestly think having one for a camera is a major plus. It makes change of settings and photo viewing much easier. The body is made in JAPAN. Need I say more? The lack of view finder and tiltable screen is something I can live without. Considering that I got to save loads. I used it on my Mindanao adventure and has given me loads of decent photos. Yehey! I just need to learn to use it so I can maximize its potential. Sayang naman the power of the camera is puro IA lang ang alam ko diba? Any tips from my photo enthusiast friends/readers?